Activities and marine attractions (marine exhibits, aquariums, turtles, stingrays, sharks) are everywhere at the Atlantis. 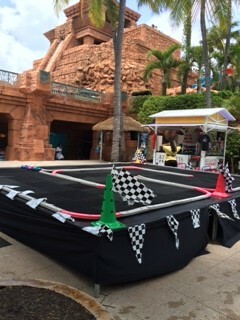 A great summer bonus is when Cartoon Network comes to the Atlantis for the summer (June through September). 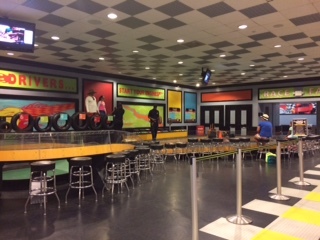 On the day you arrive go to the Cartoon Network Obstacle course and sign up for a time. You need to make a reservation early (it is free) to make sure you get a time slot. The Cartoon Network Character parade in Marina Village is on Tuesdays and Friday evenings at 7 pm. Also, don’t miss the “Screen on the Green”. 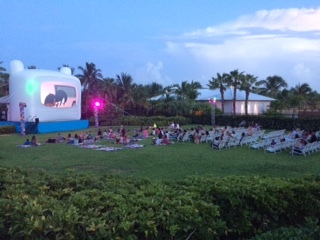 Monday, Thursday and Friday at 8 pm on the Dolphin Cay lawn. My daughter loved this! They put up a huge inflatable screen on the lawn with chairs and Cartoon Network blankets and the kids watch their favorite Cartoon Network shows. Beautiful outdoor nighttime activity! Get there on time to get the free Cartoon Network sunglasses that they give out – who doesn’t love free stuff! 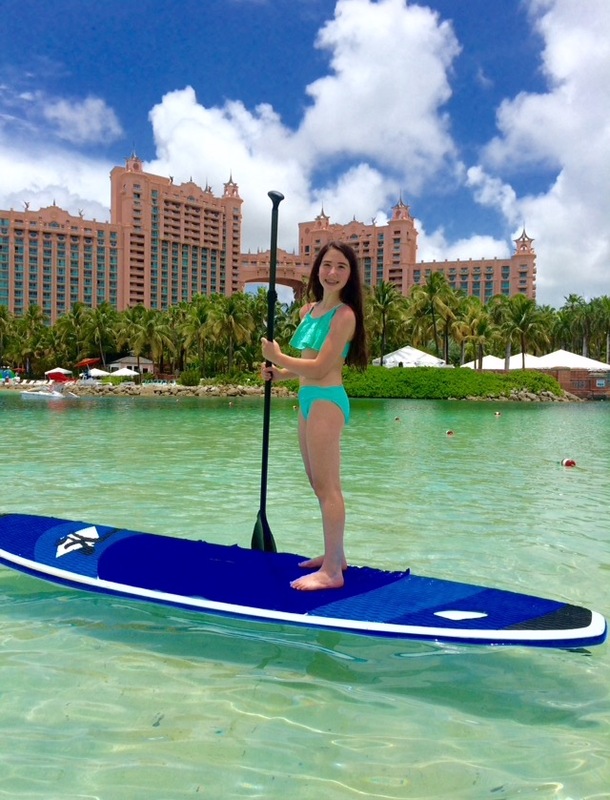 We also loved Paddle-boarding in the Paradise Lagoon. It is a great fun family activity – $44 per person for ½ hour. 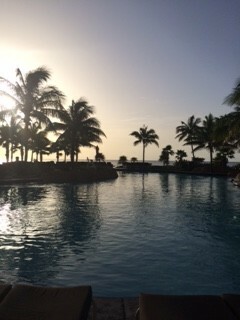 Very relaxing and refreshing. 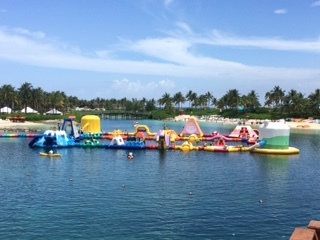 While paddling in the lagoon you are next to the Cartoon Network obstacle course so it’s like you are watching a live version of the show “Wipeout”. 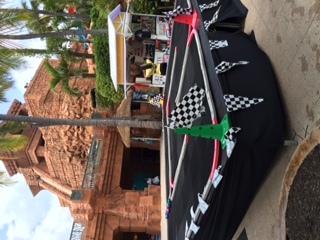 Well, not that intense because the obstacle course is for kids but great entertainment and scenery all around. 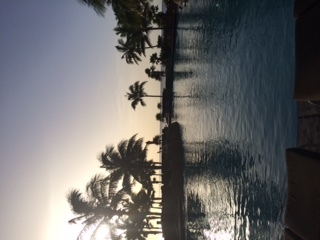 I can’t say enough about how beautiful, clear and blue the water is in the Caribbean. Perfect temperature, crystal clear water, beautiful sandy beach – we couldn’t get enough of the ocean. The beaches and sand are clean and we swam and relaxed at the beach for hours. 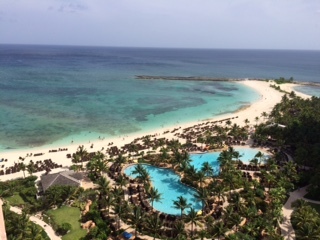 The great part about the Atlantis is that the beaches are right there – no driving anywhere to get to the beach – you can go from beach to pool to water-slide to aquarium very easily. Excited to book your trip? Contact me today, for the best rates!